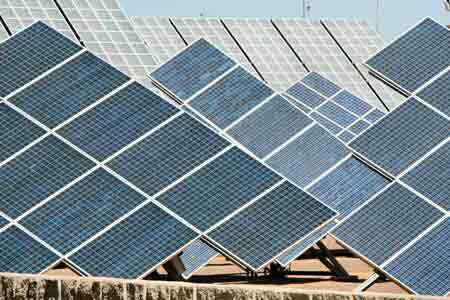 A photovoltaic array is simply a number of solar panels (or modules) arranged together to form one interconnected photovoltaic system. The power that one solar panel can produce is seldom enough to meet requirements of a home or a business, so the modules are linked together to form an array. Most solar arrays use an inverter to convert the DC power produced by the modules into alternating current that can plug into the existing infrastructure to power lights, motors, and other loads. The modules in a solar array are usually connected in series to obtain the desired voltage; the individual strings are then connected in parallel to allow the system to produce more current. Photovoltaic arrays are typically measured by the peak electrical power they produce, in watts, kilowatts, or even megawatts. A framework or structure as well as housing for the system is generally required to dependably support and orientate the array towards the sun and keep the other components dry and clean. Trackers and sensors may be used to keep panels directly facing the sun, thereby increasing their output and optimising the performance of the system. These are often viewed as optional extras in a photovoltaic system. Careful analysis is required to determine whether the increased cost and mechanical complexity of using a tracker is cost effective in particular circumstances. Building integrated arrays are increasingly being used in building construction, where they serve the dual purpose of creating a wall or roof as well as providing electric power for the building. Eventually as the prices of solar cells fall, building integrated solar cells may become a major source of electric power. In urban and suburban areas, solar arrays are commonly used on rooftops to supplement power use; often the building will have a preexisting connection to the power grid, in which case any excess energy produced by the PV array will be sold back to the power company. In rural areas, ground-mounted photovoltaic systems are more common. The systems may also be equipped with a battery backup system to compensate for a potentially unreliable power grid. In remote settings, where a power grid is unavailable, solar arrays can be used as the sole source of electricity, usually by charging a storage battery. Satellites use solar arrays for their power. In particular the International Space Station uses multiple solar arrays to power all the equipment on board. Solar power has become commonplace for certain low-power applications, such as signal buoys or devices in remote areas. In experimental form the photovoltaic array has even been used to power automobiles in races such as the World solar challenge across Australia. Many yachts and land vehicles use a photovoltaic array to charge on-board batteries.